StP356 Auderville Laye H.K.B. (E. Batt 685)., K.V.U.Gruppe Joburg, K.V.Gruppe Periers. StP356 Auderville Laye H.K.B. (E. Batt 685). Heeres Küsten Batterie E.685 3./1262. 2 x R502 twin gruppe shelter. 1 x SK/Stab Battery. (HQ bunker). 2 x Vf2a gruppe shelter. 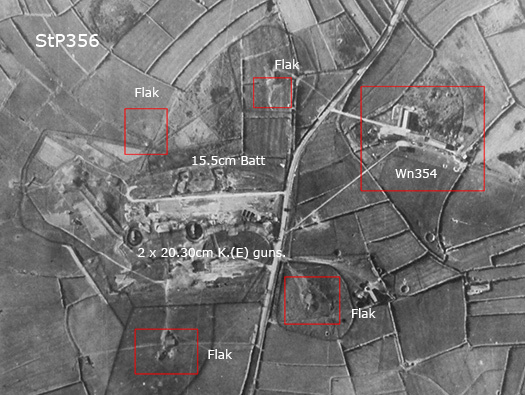 4 x Vf7a ammunition bunker. 4 x 2cm Flack 30. 2 x 20.3cm K (E) S.K.C/34 railway guns. 2 x 15.5 cm s.F.H.414(f). StP356 is the main gun position. 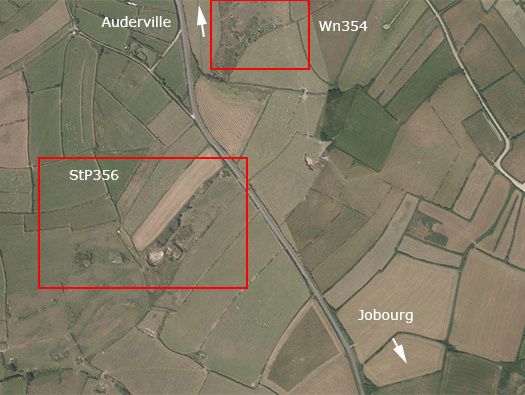 Wn354 is a large barracks area with the remains of four huts. 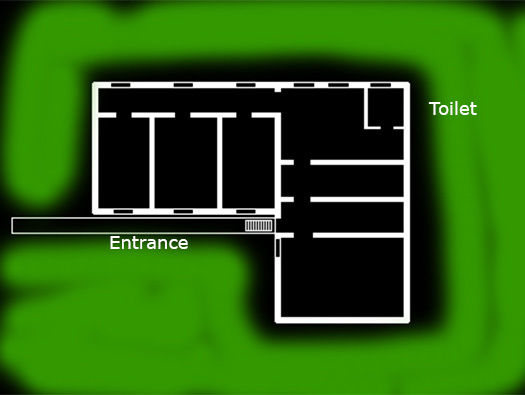 Plan of the gun positions. There were two 15.5cm s.H.H.414(f) guns forward and two 20.3cm K.(E) railway guns behind set in a small hollow to hide the guns from view. 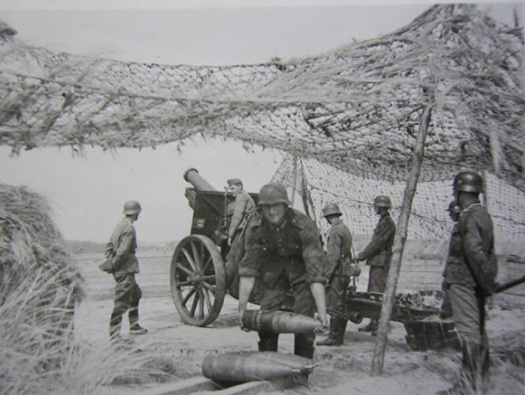 Then a ring of four 2cm Flak30. The 15.5cm gun positions are completely removed, the railway gun bases are easy to see and all the bunkers are there. At least three baraquement (barracks) are there to see and one just the foundations? We also found one Tobruk and a 2cm Flak position. Animals in fields so we could not investigate any more. 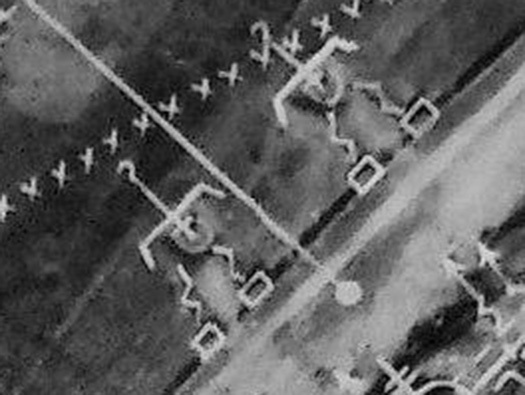 From this reconnaissance air photo the battery position is easily discerned. 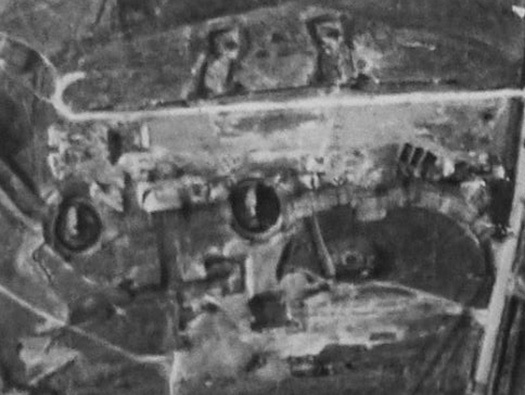 The four huts of the barracks, four 2cm flak positions, 15.5cm twin battery and the main railway gun battery in the centre. 15.5cm s.F.H414 (f) gun battery position. Two guns and two ammunition stores per gun. 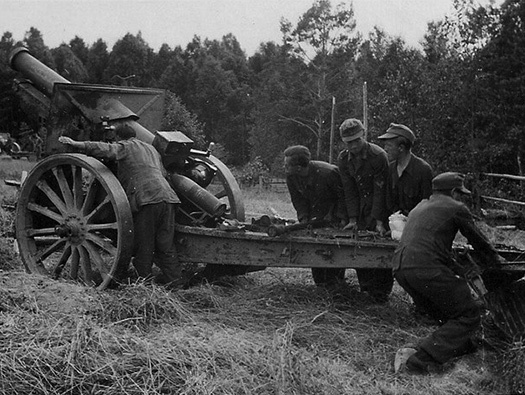 A captured French field howitzer gun designed in 1916. Two ? 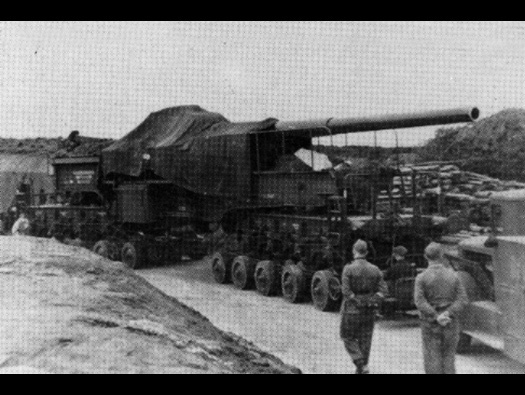 280mm (11in) railway guns. Rate of fire ? 1 - 2 r.p.m. Guns mounted on turntables 67ft diameter, 100yds apart. Secondery armament: Four light AA guns. Two entrances each side and a passage running the length, two large rooms to stack shells and powder. Blast wall covering the entrance. This looks as though it was going to be a badge of some form on the wall. Door to the first ammunition store. The door was a 434PO1 armoured door. The second room. I have just noticed that the two doors (yes its taken this long??). There are left and right?? (two different doors of the same design for one bunker --- why)??. All the way around I have realised that most German bunkers that use 434P01 doors use a left and a right opening door. Which seems rather odd. I must check on my next visit to see if a 434P01 door is reversible. I have the answer. I asked on a forum and was kindly informed what the typology is. 434PO1 doors left & right hinged.. 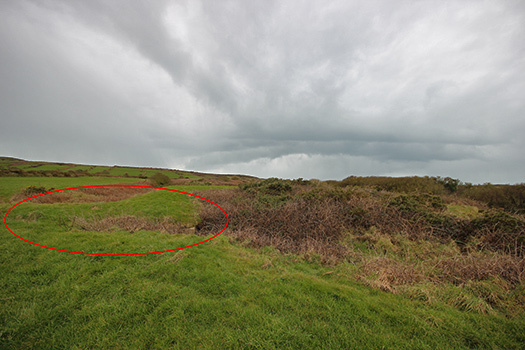 This area would have been stacked full of ready ammunition, possibly fused (not set) for a quick reaction if the battery was needed to fire. If there was continuous fire then ammunition could be brought in from the other bunkers either side. Looking back along the passage. Back outside after a scrabble to get out. 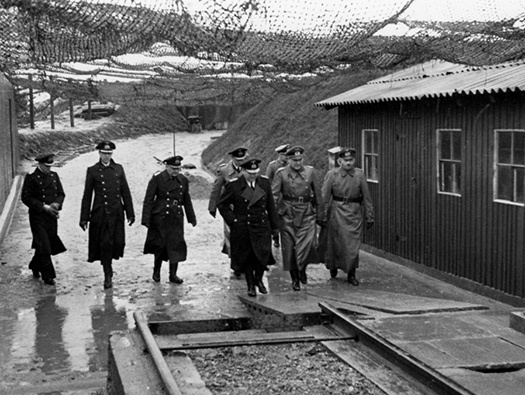 Naval & Army officers visiting the site. 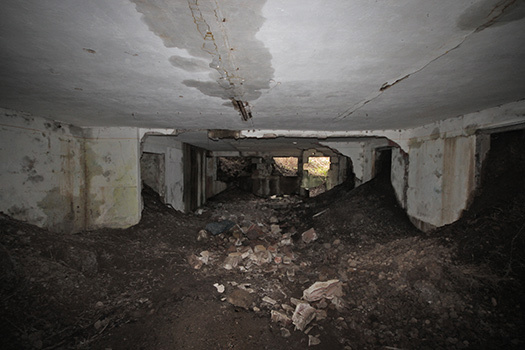 The second Vf7b ammunition bunker on the left, the first behind. 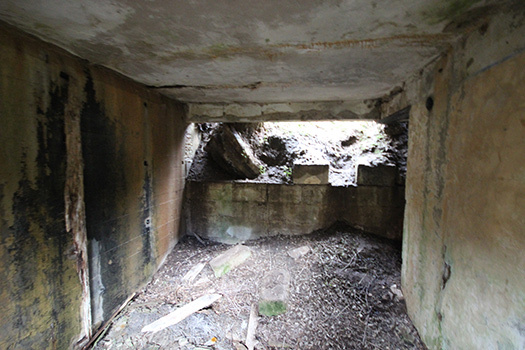 The second Vf7b ammunition bunker. 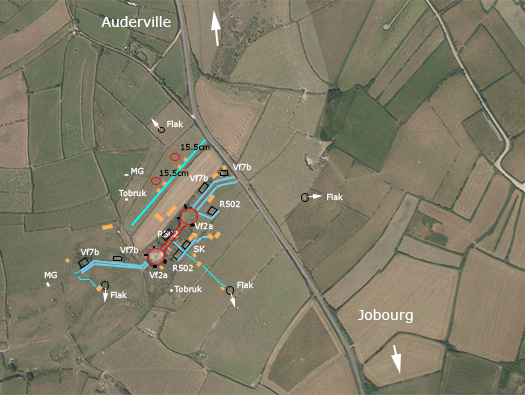 The second Vf7b ammunition bunker plan. Delivering a gun going past the second Vf7b ammunition bunker. It looks as though the drains are not working here. This one has a different entrance arrangement. Plan of the second Vf7b. Looking into the open emplacement of the railway gun. The tin hut would have been on the left of the main picture. N°919176 was the western gun and N°919177 the eastern one. The guns were towed up on low multi wheeled RW 60 Gotha trailers by two Kaeble lorries. 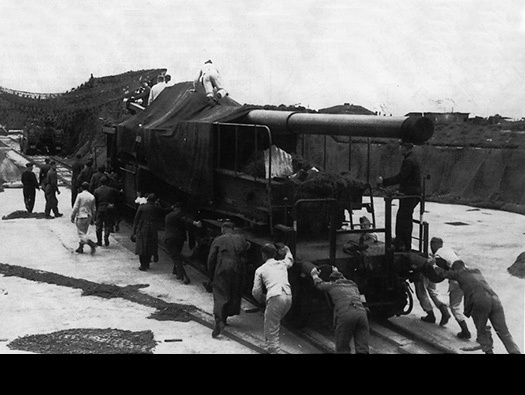 The guns arrived by train at Carteret and then placed on trailers and drawn by the two powerful Kaeble tractor units all the way up here. A railway line was laid between the two turntables and the guns trundled off by hand as it looks. Kaeble tractor unit of the Reichsbahn that towed the guns. Red line : By road. Plan of the turntable. The gun sat on rails and they sat on a large turntable. 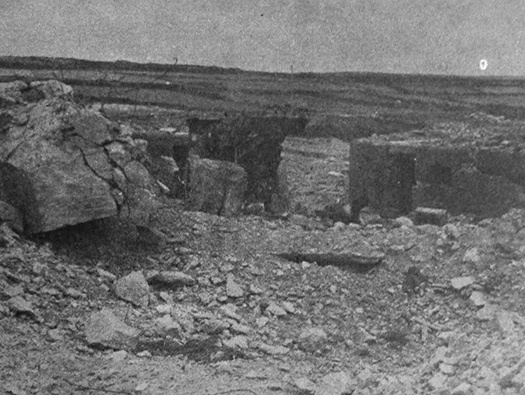 The in its emplacement after the battle. The ammunition soute can be seen in this picture. Inside wall looks as though there was an explosion inside. An interesting design, much stronger than a typical Vf2a seen along the Atlantikwall. Camouflage added made of possibly asbestos wool mixed with cement. 410P9 door with the rubber gas tight seal still in place.. The escape tunnel, first you open the door, then take out several metal slats. Here it looks as though the slats have been replaced by bricks. The escape would go up the outside of the bunker. This would be filled with gravel or sand and had to be cleared out and only then could you crawl out. Escape hatch and steel ladders running up the side of a bunker. Niche in both sides, I would like to know what they were used for? This piece of concrete must have moved by a massive explosion. Open turntable for a railway gun. This gun being positioned into place. There would have been a railway line running between the two emplacements. St. Germain Laye - 2 guns on turntables. G.S.G.S. 4347 - 28/24 N.W. 9231. (Details at the bottom of the photo). Now very overgrown path to the bunkers and HQ building..
Another style of camouflage on the wall. R502 entry voice speaking tube. This may have had anti-gas shower or a sink to wash in. Bunker sink set into a recess. Entrance passage and gas lock with two 434PO1 armoured doors. Also note that the left hand wall is cut back allowing casualties on stretchers to manoeuvre around. Details of painting on the walls. Same gas lock in 2002 and the same John. You can see the bed hook fittings on the wall and ceiling fittings for attaching chains to hook on the outsides of the bunks. bunker beds hung on hooks on the wall and chains from the ceiling. This one looks rather damaged. Plan of the heating pipes. 19P7 steel door closed off the inner room, it was not armoured but quite strong, with a gas tight seal around the edge and a small glass window. Two close combat defence windows and anti-gas fittings. Plan of the air pump. 483P2 type close combat embrasure. 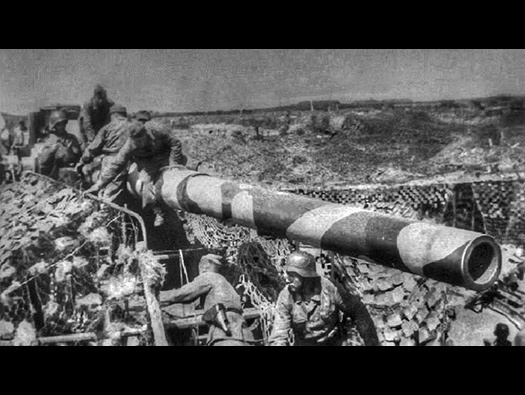 A gunner could cover the steps down into the bunker from enemy attack. R502 right hand room and another 483P2 type close combat embrasure. 483P2 type close combat embrasure. Paint on the walls painted around the fittings. It is possibly where a telephone fitted to the wall. In a normal situation this type of bunker would have had a periscope in this room, but as this is an infirmary it does not need one. This looks like an after thought, it maybe that somebody forgot to set the speaking tube pipe inside the concrete?? Another interesting detail is the door. R502 air breather vent and its not set straight in the concrete again. Back outside and looking into the second railway gun ringstand. This is how it finished up. 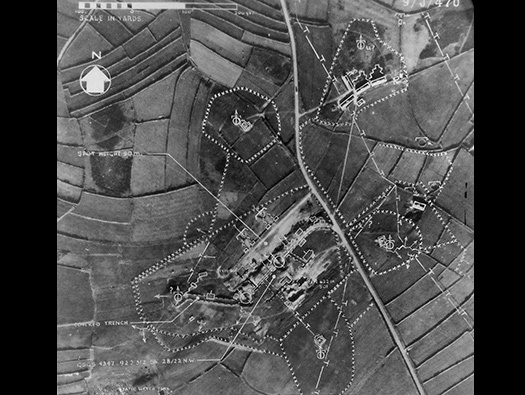 Allied Bigot map of the area May 1944. Allied Bigot map of the area. Showing what the Allies thought was there..
Planning on board a US transport. The second ammunition soute. A bit of a bank here. A large shell may have come in from the land side and almost blown the roof off. US Long Tom heavy gun. The second ammunition soute. The roof has moved quite a bit. 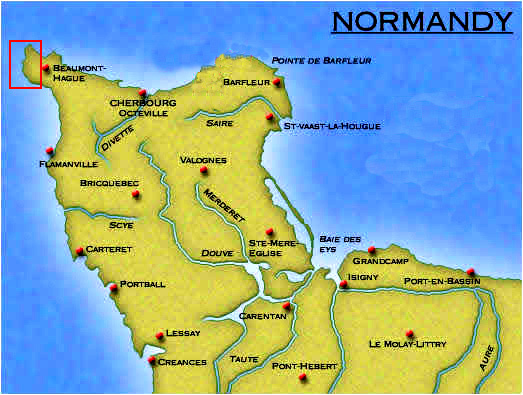 After capture, the guns were bombarded by sea and air as they could fire on the advancing Americans all the way up the peninsular and when taking Cherbourg. The same design as the other emplacement. Right hand entrance. Might even be a bit of camouflage paint but no concrete added camouflage??. Close up of the turntable. More detail of the turntable. I think this was to be the site of a new bunker, it was excavated but never finished. On the left is the Central Radio SK bunker. On the right R502 twin gruppe bunker. Both we did not enter but we did find a very interesting Tobruk. Central Radio SK bunker. R656. A very odd Tobruk or an open defence/observation position. Possibly for a guard to stand. Inside and there is several inches in water and there are many removed fittings on the walls and a telephone exchange, again removed and just the fittings showing where it was. A nice construction number 73 on a wall. Aerials were used as the cabling and earthing strips are extant. Central Radio SK bunker. Basically an R656. Marks remaining on a bunker wall. This may be a crew bunker or used as a command bunker. 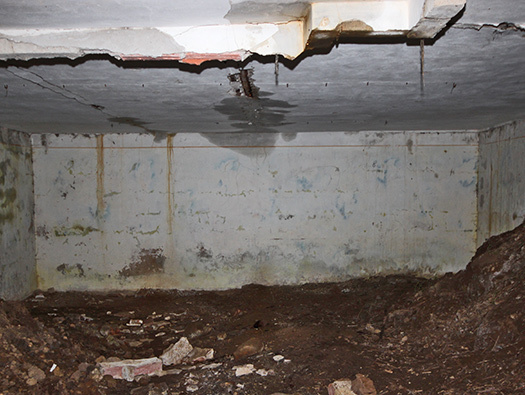 It looks to be very like the R502 Infirmary bunker. On the right R502 twin gruppe bunker and a row of Eisenpfahel barbed wire fence posts. There are so many still on this peninsular. Stated as a Vf58c but may be a Bf67neu. The Bf67neu is parallel sided but the Vf58c does not have parallel sides. Set into the Norman wall. Another Eisenpfahel again in the Norman wall. Vf7b ammunition bunker for the western gun. The next Vf7b ammunition bunker for the western gun. 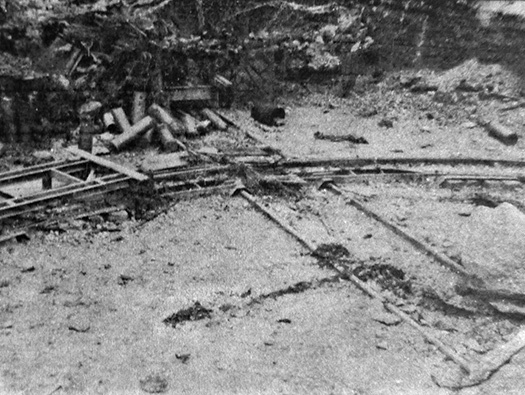 There were either small narrow gauge railway lines laid to carry the ammunition on small railway trucks. Or a concrete roadway and a four wheeled truck pulled by the gunners. Four wheeled truck pulled by the gunners. With rain over Alderney. These guns were to cover the gap between the Cherbourg peninsular and Alderney. 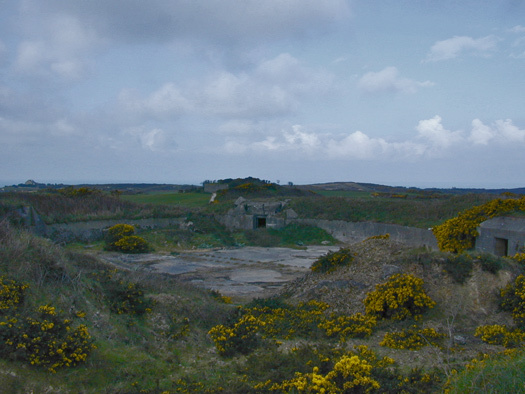 Laye guns and a battery on Alderney were to cover the gap. 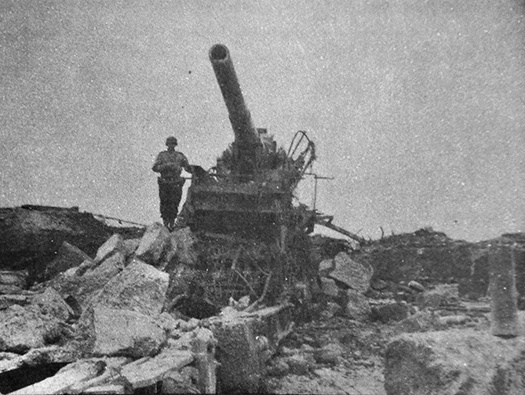 When eventually the batteries on Alderney were shelled in June 1944 by HMS Rodney. 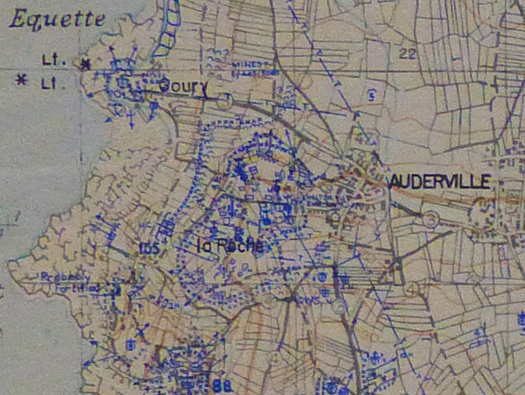 She sat in the lee of the peninsular and fired right over Cherbourg to Alderney. The two batteries covering the straights. My plan of the baraquement. The plan is from memory and may not be exact. A hole was dug and a flat roofed baraquement was built and the roof covered with turf as camouflage. There was one entrance that I could find and a toilet. I am reasonably sure there was a toilet as that is the way I entered through its window. Oh what fun we bunker hunters have. As you slide into the toilet, this is what presents itself. Detail of the end wall. This is the long rear passage. The end room and this also has painting on the walls. Window on the left and door on the right. The roof of the baraquement circled in red.